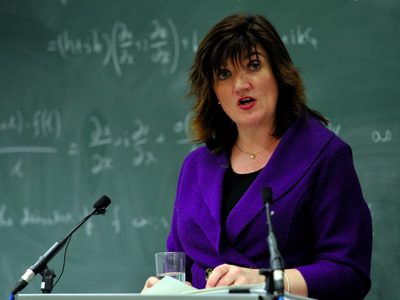 LONDON — Former Education Secretary Nicky Morgan will be the next chair of the Treasury Select Committee, it was confirmed on Wednesday as MPs voted to elect her to the position. Morgan, who has no direct formal career experience in the financial services sector, was largely seen as the favourite for the job before the vote thanks to her ministerial experience and high public profile as one of the most prominent female Conservatives. She is the first woman to chair the committee. She beat five other candidates, including North West Somerset MP and sitting TSC member Jacob Rees-Mogg, to take the role. “As well as inquiries into Brexit, I would be keen to hold inquiries into issues that are of most relevance to our constituents such as: tax policy, public spending decisions, household debt, skills funding, the National Infrastructure Plan, childcare funding and income inequality as well as quizzing Ministers on economic policy and critical issues such as productivity,” Morgan told MPs when announcing her pursuit of the role. The role as head of the committee is a crucial one within the UK political system and is tasked with scrutinising both the government and senior figures from the financial services industry, as well as the Bank of England. Although she has never worked in the financial services, Morgan spent the 1990s working as a lawyer for law firm Travers Smith, specialising in corporate law, including mergers and acquisitions. After leaving the legal profession, Morgan spent around ten years in local politics, including standing unsuccessfully in the London constituency of Islington South and Finsbury at the 2001 general election, losing out to current Shadow Foreign Secretary, Emily Thornberry. During 2005’s general election, Morgan stood unsuccessfully once again, this time in the seat of Loughborough, achieving a 5% Labour to Conservative swing, compared to a national average of 3.1%. Morgan stood in the seat once again in 2010, beating out incumbent Andy Reed by 22,000 votes to 18,000. Morgan became first the Parliamentary Private Secretary to the Universities and Science Minister, David Willetts, before taking a role as an assistant whip in 2012, and was then made the Economic Secretary to the Treasury in 2013, a role Morgan cited in her statement to MPs. “My Ministerial roles have given me an insight into how the Treasury functions from the inside and outside,” she wrote. “I have been a Treasury Minister, having served as both Economic Secretary and Financial Secretary in 2013 and 2014. Morgan subsequently went on to two bigger jobs, serving as Minister for Women and Equalities during 2014, before being promoted once again to the role of Education Secretary. “As the Secretary of State for Education and Minister for Women and Equalities, I worked with the Treasury on the 2015 Spending Review,” she noted in her statement. Morgan served as Education Secretary until Theresa May became Prime Minister last July, when May replaced her with Justine Greening.